"This dog has a lot of showmanship." "Very beautiful male with excellent proportions and very charming poodle essence." 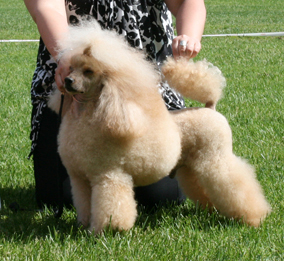 Finik was absolutely my best show dog. He loved dog shows and we were always having fun in the show ring. Of course he had a bad day sometimes, but don't we all? 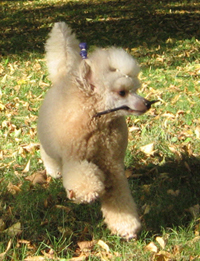 Most of the time he was showing himself with such a great attitude and didn't hesitate to wag his tail. 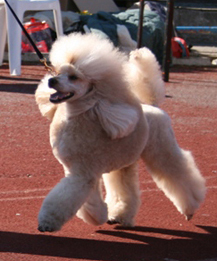 Finik was retired from dog shows at the end of year 2013 and he retired with style: Finik was #2 top winning poodle in his breed and #3 top winning veteran poodle (all sizes and colours)! 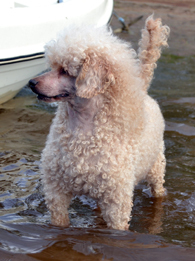 Finik was always very healthy dog but then something happened and he became old so quickly. During his last few years he got through testicular cancer, teeth started to cause problems and some of them fall off or was removed, he had some bad infection and his liver was struggling, and then he got kidney failure with old age. One day I made a promise to Finik that when it's time to let go, I won't hesitate for a second. It was time to keep my promise at the beginning of June 2017 when Finik was almost 13 years old. Till the very end of his time Finik was still the boss of our dogs and always by my side. I guess it's not a surprise that Finik was the dog of my life. He was so amazing that I can't really tell it with words. So funny, so kind, so obedient and so humble. He truly had a golden heart. Finik was simply the best. "Great freedom on the move. Most collective and showy. Pleasing exhibit, well deserved his title."